When it comes to learning Chinese the iPhone (or also an Android phone) can make a massive difference. The biggest obstacle to learning Chinese is, not surprisingly, the characters. There are over 40 000 characters and you need at least 2,000 to read a newspaper. Chances are fairly high that you will come across a character that you don’t know. So what can you do? You can look it up in a dictionary. Well, good luck. It seems that every dictionary has a unique way of sorting characters. And to understand the system you need to have some knowledge of Chinese characters and how they are built up. Smartphones nowadays feature a Chinese character input system. Just write the character on the screen and your phone should recognize it. I say “should” as it’s easier said than done. Chinese characters have a so called “stroke order”. Generally it’s from left to right and top to button, with a few exceptions on the way. If you draw one stroke before the other, chances are high that your smartphone will get confused and won’t display the character. And that’s where one of the best applications for Chinese comes in handy. Let me introduce you to Pleco. I started using Pleco around five years ago. First on my Palm, later on my iPhone. Back then it had the most sophisticated character recognition systems. You can get the app for free on Apple App store on Android’s market. Within the app you can download some dictionaries free of charge. However the really good ones (e.g. the Oxford Chinese dictionary) comes at a price of USD 15, which is still reasonable. Currently nine dictionaries are available for purchase and various add ons. Apart from audio files, flash cards and stroke order diagrams you can also download an add-on that had a dramatic effect on improving my Chinese reading ability. Pleco’s OCR (Optical Character Recognition) software is another USD 15 but this amount is entirely justified. What you can do with the OCR is simply mind blowing. Hold your smartphone camera on a character and the app instantly recognizes and translates it for you. It doesn’t matter where the character is printed. You can use it on a book or newspaper. It also works on street signs, in the MTR or when you want to translate a character displayed on an advertising on the other side of the road. And since Pleco’s dictionaries are installed on the device, you won’t burn your internet traffic allowance. 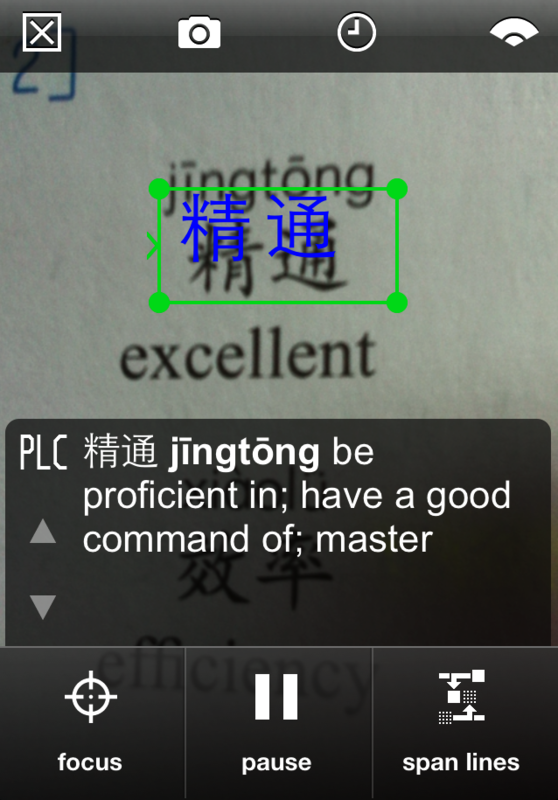 In my example I used Pleco to translate the word “jingtong” which means “excellent, proficient, having a good command of”. I first defined the search field (the green box) and held it on the two characters. I focused and the software did the rest. It’s amazing. Simplified characters used in the PRC are no problem for the app. In Hong Kong, Taiwan or Macau, where the traditional characters are used, it’s sometimes more difficult as these characters are more complicated and have more strokes. I was able to translate most restaurant menus in Hong Kong though. 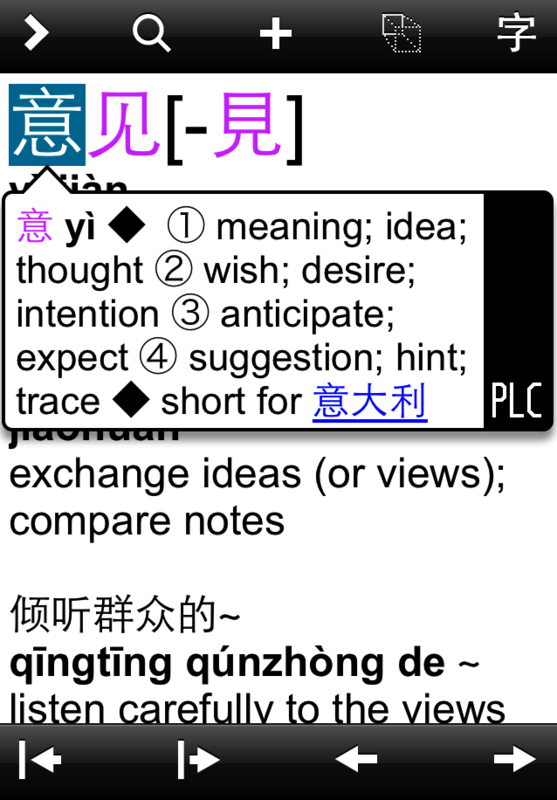 The OCR function makes learning Chinese a lot easier. Looking up Chinese characters took me forever. Reading a text with a lot of new characters was quite a time consuming affair. But no more. You can manage to read a small newspaper article, just with this application. If you’re serious about learning Chinese, make sure to download this app.